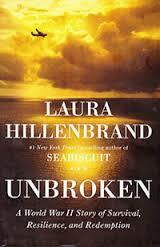 About fifty pages in, it becomes obvious why “Unbroken” has topped bestseller lists for three years and is again at number one in this week’s New York Times Book Review. It’s a riveting account of what American POWs endured in Japanese captivity during World War II. The book focuses on Louie Zamperini, a colorful character and former Olympian whose B-24 was shot down over the Pacific. Louie and his raft mate drifted at sea for 47 days before capture. They then spent three years being starved, brutalized, dehumanized and humiliated. “Unbroken” graphically depicts the horrors of a place like Omori Prisoner camp, and its sadistic enforcer, Mutsuhiro Watanabe, who later becomes one of history’s most wanted war criminals. Readers also get a glimpse into the Japanese psyche leading up to WWII, and how the country’s militarism, its nationalism and sense of superiority becomes carte blanche for their military to routinely use torture and cruelty as a weapon of war. There isn’t much I can add to the large body of commentary already written about this powerful book, but one takeaway is that man’s capacity for inhumanity is only superseded by his ability to forgive. A powerful component to “Unbroken” comes from poignant stories of how Louie and some of the other, but not all, freed POWs eventually used the power of forgiveness to heal their physical and emotional wounds. Forgiveness, as much as freedom and access to medical care is what really saved many POW lives. Now, 71 years later, if we consider the lasting peace that exists between these two countries, we see that American POWs are not the only participants in that conflict who were able to let go of hatred, bitterness and a desire for revenge.